with the behavior of women amid sexual misconduct claim. In India, hundreds of employees in India, including hundreds of women employees in India, have unpredictable walkouts on Thursday against the softening of the company's behavior and sexual misconduct with women. 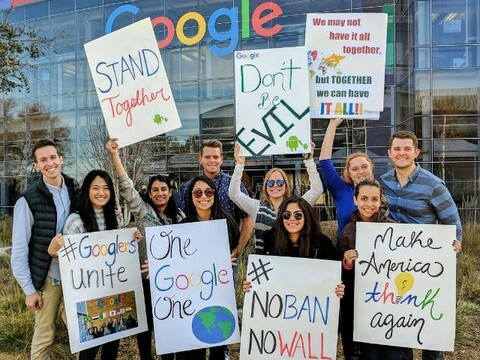 Prior to this walkout called 'Google Walkout', the investigations in New York Times revealed years of allegations of sexual harassment, package of millions of dollars to the accused executives, and lack of transparency in these cases. Employees are demanding a significant change in the manner in which those allegations of sexual misconduct are dealt with. They also have a demand for abolishing forced reconciliation so that it can be possible to prosecute the victim. Forcible Reconciliation is a common mechanism for the employees of Silken Valley, under which any dispute is disposed of internally rather than outside methods like the court. The absence of uneven salary and gender representation was also involved in employees' concerns. When contacted, the Google spokesperson confirmed that 150 employees participated in India. These employees were from Hyderabad, Gurgaon and Mumbai offices. Pichai said that many employees told him about unfair treatment during the work. He said, "I am extremely sorry for the past actions and the grievances of the workers due to this." Pichai said in the message, "Being the CEO of the company, personally it becomes important to me that we will be treated unfairly But he said that Google has taken 48 employees including 13 senior executives, due to allegations of sexual harassment in the last two years. Pichai has met Google's staff after the report came in the 'New York Times' last week on this issue. It was reported in the report that Android manufacturer Andy Rubin, a senior Google employee, has been given a package of $ 9 million while leaving the company, while he is accused of sexual abuse, and Google has the ability to screen curtains on sexual harassment claims Done However, Rubin's spokesman Sam Singer has dismissed these allegations.